The journal was founded in 1892 by a group of literati and historians, most well-known of whom are Benedetto Croce and Salvatore di Giacomo. It appeared as a monthly and was published by a local publisher, Pierro. It bore the sub-title “rivista d'arte e topografia napoletana” [Review of Neapolitan Art and Topography]. The first issue included, among many other items, an article on the churches that were being demolished in order to go through with the great urban renewal of Naples, the risanamento. The journal ceased publication in 1907 when Croce withdrew his support in a discussion over the editorial direction the journal should take. It was refounded in 1920 but lasted only two years. Napoli nobilissima was revived in 1961 under the direction of Roberto Pane, an architect and university professor. It was published once every two months and bore the subtitle “rivista bimestrale di arti figurative, archeologia e urbanistica" [bi-monthly review of figurative art, archaeology and urban studies]. Editorially, it spoke out against urban decay and abuse, a particular sore spot with the editor, Pane. He died in 1987 and the journal passed into the hands of Raffaele Mormone, who more or less continued the same editorial line. The journal had another crisis in 1997 but renewed publication in 2000 and is currently a quarterly bearing the sub-title "rivista di arti, filologia e storia" [Review of Art, Philology and History]. Recent issues include a survey of museums in the Campania region of Italy and an article on the tavola Strozzi; from 1473, it is the oldest known map of the medieval city of Naples. 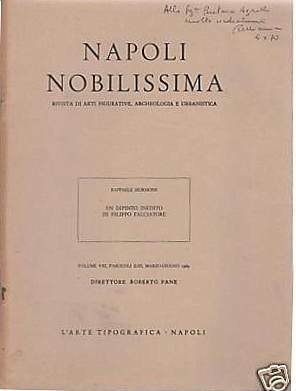 In 2003 there appeared an interesting book about the beginnings of the journal: Rileggere Napoli nobilissima. Le strade, le piazze, i quartieri [Rereading Napoli nobilissima, the streets, squares and quarters] by R. De Fusco (pub. Liguori, Napoli). Here you can read some of the original articles from the turn of that century plus modern editorial updates on the items discussed. Also, the Digitized Italian Journals section of BiASA (Biblioteca di Arte, Archeologia e Storia dell’Arte) [Library of Art, Archaeology and Art History) in Rome has digitized the years 1892 through 1922.